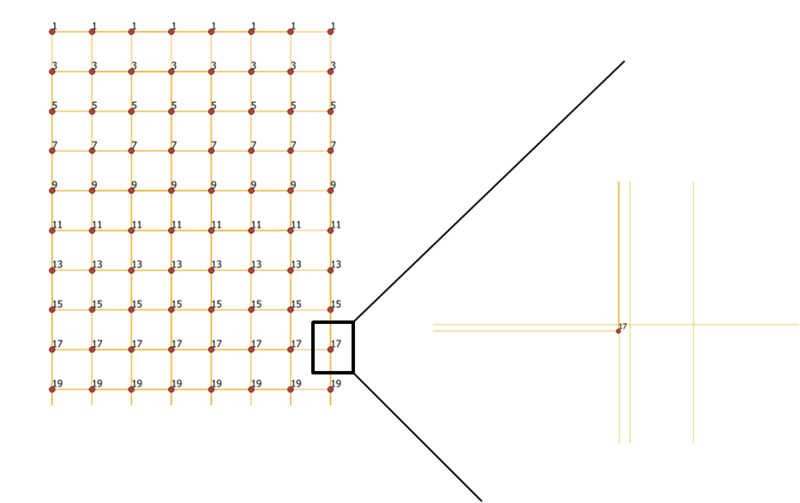 1-Vertical's rows: I numbered the points in the vertical of 1 to 8 and created one vector with point to path tool. 2-Horizontal's rows: I numbered the points in the horizontal with odd numbers and created another vector with point to path tool. 3-Following, I merge this vectors. However in the end result, I noticed that the lines created were parallel. The lines pass in the points one more time. I tried separated the parallelal lines with vector --> data management tools --> split vector layer. I tried also vector--> geoprocessing tools --> dissolve. But both did not work. How can I solve this? Browse other questions tagged qgis vector-grid grids-graticules point or ask your own question. How to draw points around a circle in QGIS? How connect points with lines in QGIS? Does sum line length measures geodetic or planar distance?